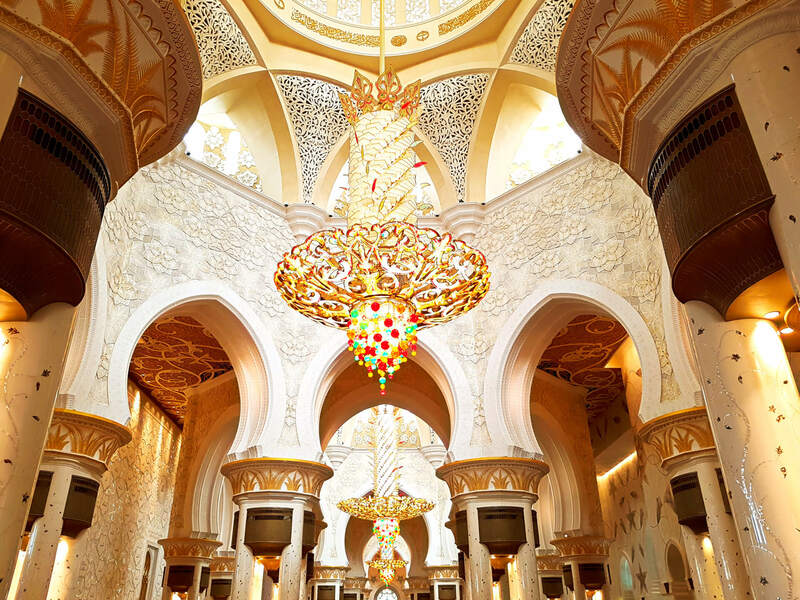 What they call the Grand Mosque in Abu Dhabi is, in my opinion, a misnomer. Grand just seems to fall short as a description. 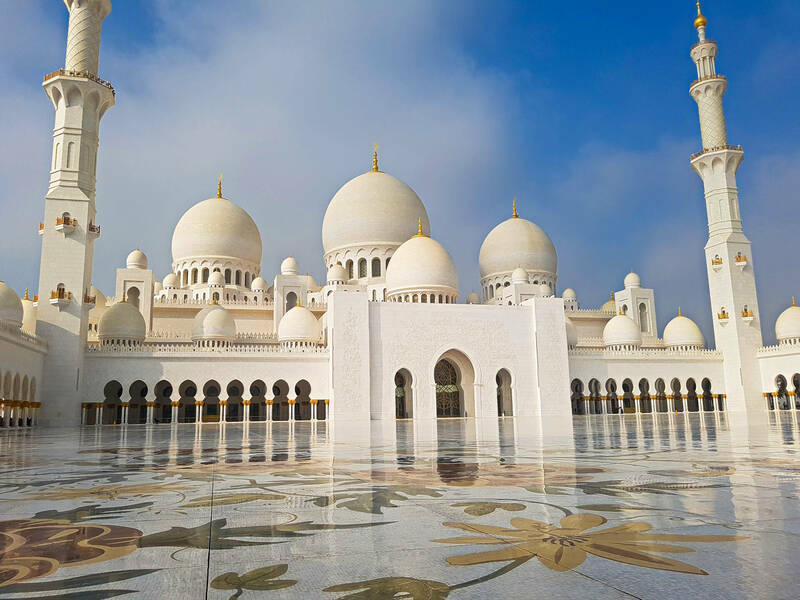 The full name is the Sheikh Zayed Grand Mosque, named after the late Sheikh Zayed who unified the seven Emirate states into the United Arab Emirates (UAE) back in 1971. 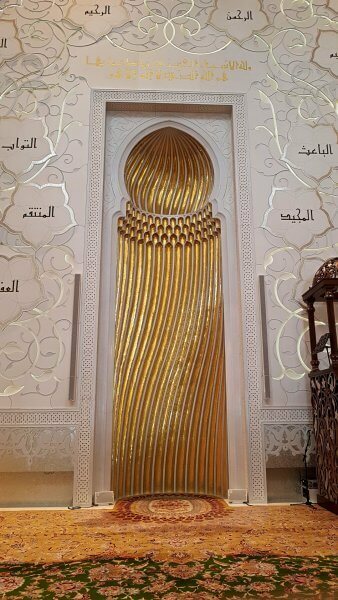 Construction was started in 1996 and completed in 2007, three years after the sheikh passed away. Simply put, the mosque is massive and magnificent. 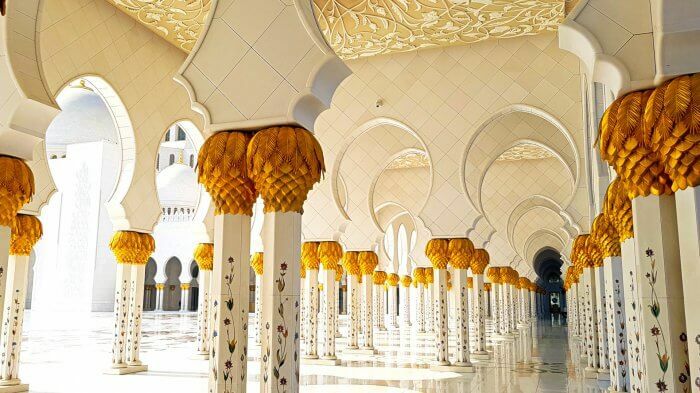 It’s the third-largest mosque in the world, and can hold up to 41,000 worshipers at a time within its chambers and courtyard, not including the extensive additional gardens currently under construction. 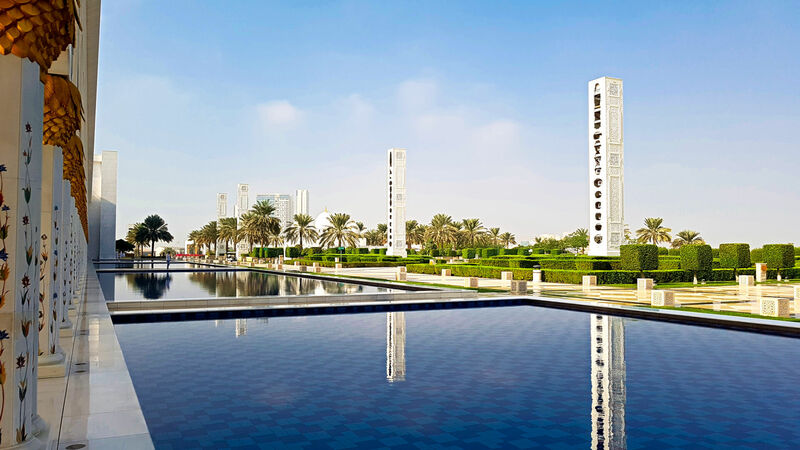 The central courtyard is 180,000 sq ft, and has the largest marble mosaic in the world. Surrounding the courtyard, there are 1096 columns supporting the four minarets and eighty domes. Each column has six sides, and each side has three panels of marvel inlaid with laser-cut precious stones. Each panel had to have a 99.99% accuracy to be used. The marble itself is the whitest marble the designers could find in the world. What’s more, the marble and stonework can withstand the heat of the desert, sandstorms and even earthquakes. The reflection pools around the mosque give it a spectacular appearance, especially at night when lights shine upon the entire mosque. But the pools have another vital purpose you might not think of. 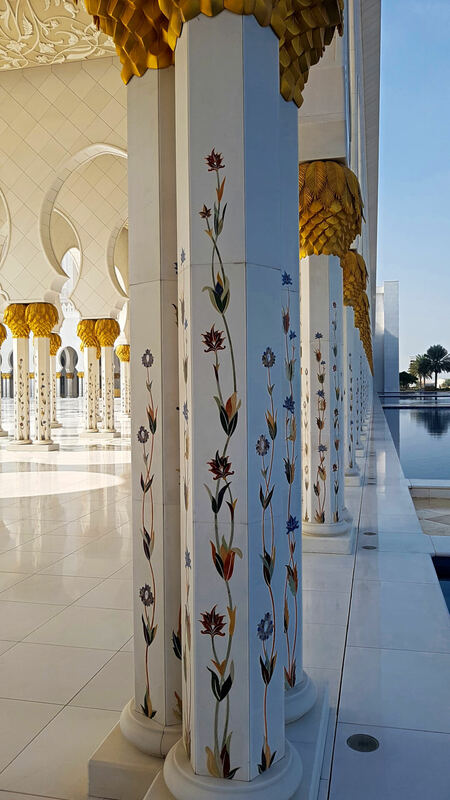 The water acts as a natural coolant for both the marble and the interior of the mosque. Thus, the space inside is several degrees cooler than the outside temperature. The real work of art is in the main hall, which has some truly unique and mind-boggling features. As I walked in, I was astounded to see the level of perfection, artwork and opulence which went into creating the masterpiece. The carpet is the largest single-piece, handmade carpet in the world, measuring over 60,000 sq ft and weighing 35 tons. It’s composed of 2,268,000,000 knots, which took 1200-1300 workers nearly two years to complete. The carpet also has a Muslim feature I never knew about, which is parallel ridges shaved into the carpet, so that the worshipers can be arranged in straight rows as they pray. 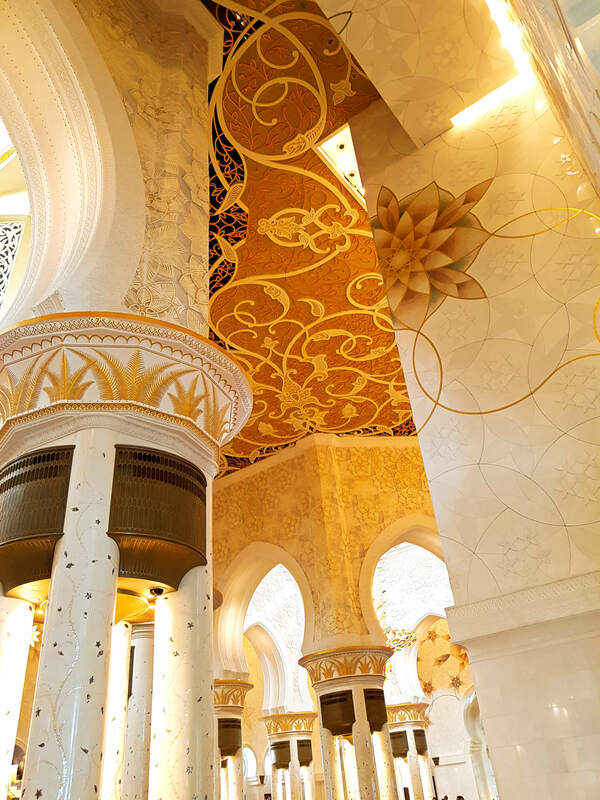 Between carpet and ceiling are 96 massive marble columns, all hand carved and designed to fit perfectly. Above these are the four giant chandeliers made from millions of Swarovski crystals. 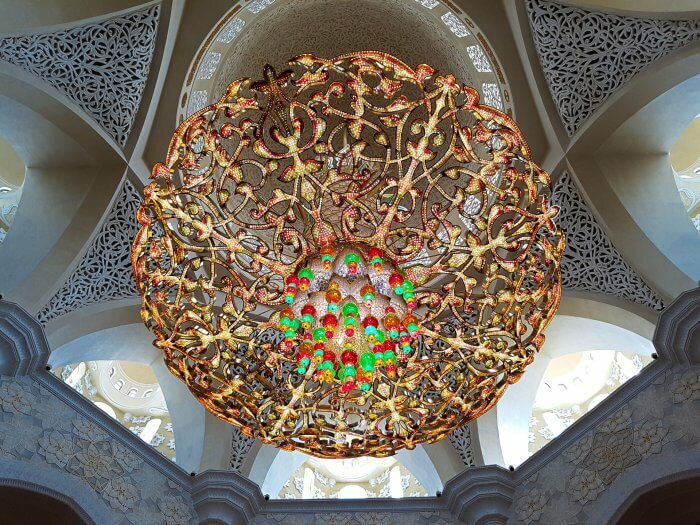 The largest chandelier is 33 feet wide and 49 feet high, the third largest in the world. Beside the main mosque, there is a shrine with the tomb of Sheikh Zayed. The entire Quran is recited at the tomb 24 hours a day, over and over. One recitation is about 36 hours, and there are a team of men assigned to keep it going non-stop. In accordance with Islamic tradition, no photos can be taken of this structure, and the guards are very protective of anyone getting near it, even though it’s not technically off-limits. 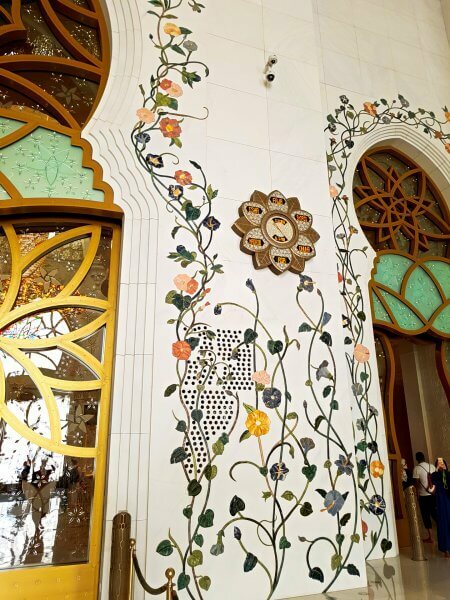 The rest of the architectural features and artistic designs are almost too numerous to describe. 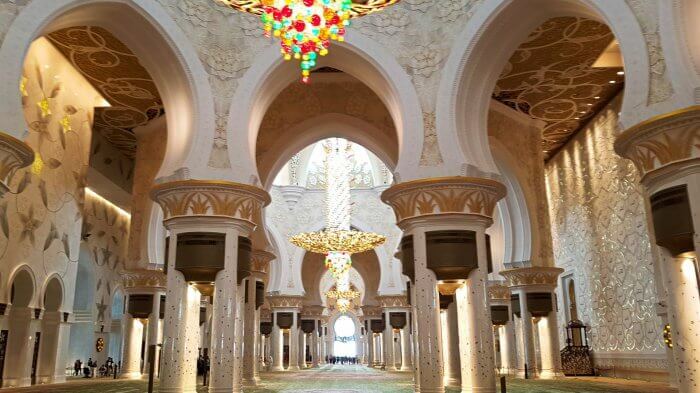 There is one incredible feature pervading the entire mosque and every portion therein. All features are perfectly symmetrical, even in the carpet. This embodies the Islamic concept that we are all equal to each other, something that was inculcated several times to me during my visit. Visiting the Grand Mosque is free for all visitors, and open from Sat-Thurs 9 AM to 10 PM, and Fri 4:30 PM to 10 PM. Please note the hours change during Ramadan. 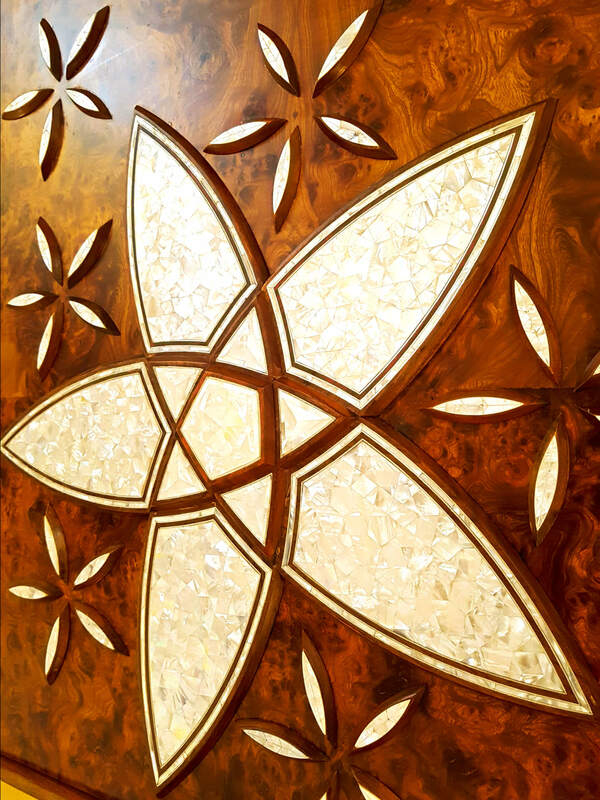 There are several free tours of the mosque each day, but with varying hours. The tour lasts about an hour. The dress code is strictly enforced. Men must cover their shoulders and knees, and women must cover their ankles, arms and hair. Don’t worry, if you’re not wearing the clothes, you can get robes and scarves at the entrance. To get to the Grand Mosque, easiest is to jump into a taxi. Buses are harder to find from within the city, and require a transit card. The Abu Dhabi Hop-On, Hop-Off Bus Tour will also take you to the mosque. Expect to spend a couple hours to see everything, including the tour. With all the information I’ve given you here, nothing will truly prepare you for what you’ll feel and experience at the mosque. The dimensions and art work can only fully be appreciated in person. I hope you make it part of your itinerary in the near future.